Mayor McGinn at the Beacon Hill Town Hall at Jefferson Community Center on February 15. Photo courtesy City of Seattle. 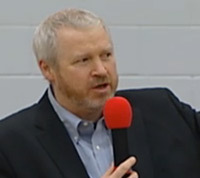 Mayor Mike McGinn this week sent out a follow-up email addressing unanswered questions that were brought up at the February 15 town hall meeting at Jefferson Community Center. Topics addressed include broadband access, future use of the closed Neighborhood Service Center, a possible Alcohol Impact Area on North Beacon Hill, and the SeaTac flight paths overhead. 1. What power does the City have to regulate Broadstripe and other broadband providers? The City of Seattle regulates cable television service for Seattle residents, and we also own the physical conduits through which the cables that provide that service travel, but the Federal Communications Commission has restricted the ability of cities like ours to regulate internet service providers. Where we do have power is in our contract negotiations with these companies. Our next opportunity to renegotiate our cable contract with Broadstripe will be in 2017. They have little capacity for significant service improvements, as they are now in bankruptcy (although still complying with the contract). The last contract renewal led the Department of Information Technology to look into creating a city-wide fiber-optic network in the first place. We know that there’s a huge need for faster and more reliable Internet access across the city, and that’s why we’re working on a business plan for municipal broadband. 2. Can members of the community use the old Neighborhood Service Center site as a volunteer-run community information center? The different departments involved are still discussing how to use the space going forward, and no decisions have been made so far. In the meantime, Department of Neighborhoods staff are using the space on a drop-in basis, and community groups can also make use of other meeting rooms in the library. 3. What will it take to make Beacon Hill an Alcohol Impact Area? As Captain Nolan and I mentioned on the 15th, the designation of an Alcohol Impact Area is something that’s done by the Washington State Liquor Control Board. More information about the designation process can be found here; links to studies of the effectiveness of AIA’s are here; and information about the processes that the City went through specifically in 2004-2006 are available here. 4. Is there anything that the City can do about flight paths going into and out of SeaTac? The Federal Aviation Administration regulates flight paths; the City, County, and Port don’t have direct regulatory authority over the airspace around the airport, but the FAA has been receptive to community input in the past. The Magnolia Community Club, for example, had a recent success when the FAA decided not to lower the level at which aircraft would be allowed to fly over Seattle neighborhoods. There will be an opportunity for the public to comment on the FAA’s Next Gen initiative, which will include re-evaluating flight plans that affect SeaTac and Boeing Field. Please E-mail me directly with your comments and concerns regarding flight paths over Beacon Hill, and I’ll be sure that we pass them along to the FAA. For more information about the Magnolia Community Club’s efforts, please contact Robert Bismuth at AirportNorth@gmail.com or 206-941-1923. I hope the information in this E-mail is helpful; if you have input on how to improve our Town Hall follow-up going forward, feel free to contact Sol Villarreal in my office at sol.villarreal@seattle.gov or 206-427-3062. For other opportunities to talk to myself or other City staff in your community please see our Public Outreach and Engagement Calendar at http://seattle.gov/engage/access.htm, and as always, please write to me with any questions, comments, or concerns that you have at mike.mcginn@seattle.gov. It’s an honor to be able to serve as your Mayor; I’ll look forward to seeing you again soon.